Numerous typing softwares are available in the market. You only have to pick best typing software which helps you to do your work systematically and to finish it in the given time. In this article, I am giving you information about the top ten best typing software which helps you with your typing skills. These softwares are masters to improve your typing skills and you will be able to do your work skillfully. These softwares help you to enhance the ability of typing with the help of its amazing features. These softwares definitely help you to become a good typist. Here you go through the list of softwares given below and perform your typing work smartly and become experts in super fast typing. How to improve typing speed naturally? KAZ elaborated as Keyboarding A-Z. This software is the most advanced teaching and learning method. This is one of the best typing software as it has a quick learning process; it just takes 90 minutes to learn A-Z keypad and only 4 hours for the whole keyboard. This software is based on the latest brain research. The learning process includes Brain balance, i.e. it engages the important sense of sight, sound and touch simultaneously. A revolutionary method of this software helps to train both the hands to work consistently. It comes with an elegant and efficient structure. It includes a various training module. This software consists of 30 games with fun exercises. The KAZ provides you with musical training. The software is filled with colours and fun. This software doesn’t allow pausing lessons in between the session. Travel theme of KAZ may slow your system. It provides only a single computer license. This software doesn’t have tutorials. An online annual subscription costs the US $24.99, and for regular windows and MAC, it costs the US $39.99. KAZ software requires OS X 10.9, Mac OS X 10.4 or Windows 8, 7, Vista, XP platforms. KAZ is the best typing software for all the busy bees. If anyone wants to learn the skill of typing more efficiently, the KAZ will teach you these skills in just 90 minutes. This software provides you smart approach to learn the keyboard. If you are looking for industry-leading typing software, then Typesy is an excellent choice for you. 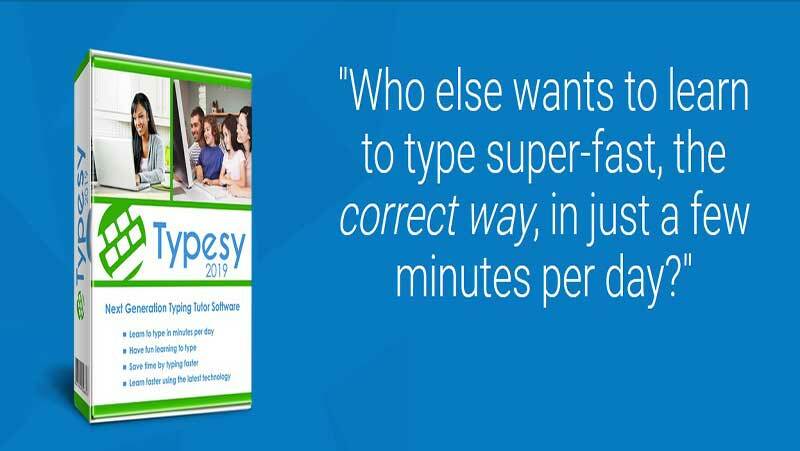 Typesy is easy to use; this software is specially designed for the new generation because it is the only typing software which provides the user with videos and exercises just like a typing instructor. The superiors in the office always underestimate slow typists and sometimes they are fired from their job, hence using this software may help them to improve their typing skills because this is one of the best typing tutor as Real touch experts have designed it. Typesy contains 517 lessons of typing and activities. Based on the latest technology of 2019. Videos and exercises available which helps to learn to type easily. Sharing of progress and activities on social media with friends. Except these, it has some other features like it allows tracking of your targets, you can sync all learned lessons in all computers, it gives you guarantee of increase in speed of typing three times more than now. You can learn and be a master in typing fast. This app provides you with different activities so that young ones and elders both find this app more suitable similarly. Kids can improve their typing speed with accurate results because the software provides a fun loving atmosphere to learn. It offers with hangman and computer typing monster; two games for kids. It gives video training which makes easy to learn typing skills. Once you paid for this software, it allows you with an unlimited number of installation on all your desktops. There are some things which are confusing and hard to handle, so you need to be computer literate. Peoples who are more sincere towards increasing their typing skills don’t like the fun element of this software. Strong internet connection required because it is a cloud-based software. A sad part of this software is that this software is not free; you have to pay US $29.95 to download this on your desktop. All the agreements are secure, and with 12 months no question money back guarantee. This software can give a better experience on platforms like Windows (versions 10, 8, 7, Vista, XP) Mac OSX, Linux and Chrome OS. This software has 4.5 stars out of 5 on rate charts. WHY TO USE Typesy software? You have to use this software because it helps you to accurate your typing skills with the help of videos which explains the activities very clearly. This software has the “cloud & social” feature which helps you to take lessons of typing with family and share your progress with the friend and most important is that you learn the typing skills in very less time because this software has a big visual database. Typing.com is one of the best typing software for the beginners, and for teachers who want to make their students expert in typing skills. Themes and interactive lessons help to engage you in learning accuracy in typing. This software is ideal for teachers and students. Typing with engaging lessons and gamified learning process. Keyboard expert designed this software in such a way that can be enjoyed by every skill level students. With each lesson, complete custom themes and avatars level up. The plus point of this software Is, it makes easy for teachers to teach their students about typing skills with the help of joyful instruction about typing and performance data. Minus points of this software is that this software doesn’t allow teachers to give personalise exercise to students and advertises distracts very much. The typing.com is free for teachers and students as well. So what are you waiting for, go and grab the software that makes your students super fast typist. The software supports in 15 international keyboards including QWERTY, AZERTY, QWERTZ and you can use this software on your Laptops, PC, Tablet, Phone, and Chromebook as well. Teachers have rated this software 4 Stars out of 5. This app gives you clear instructions with fun-loving learning lessons. Teachers can accompany the whole class and able to keep records of every activity of the students. One of the main reasons to use this app is that it is the best typing programmer for free. UltraKey is the software which reliably works and those who wants to learn touch typing skill, then this software is the best choice for you. Are we going to learn something what we need the most? Yes right, you need to be much focused to achieve your goals, and UltraKey helps to motivate you. This software is beneficial to learn touch typing. UltraKey is the best typing software for its features and becomes a learners choice. UltraKey gives the certification course of touch typing. Works effectively for any level of skill learner. This software appreciate and congratulate you on achievements of the goals. Improves your touch typing speed by instructing with the help of videos, images and animation. Once you create UltraKey, it gives free support to email, phone and web. It administers the typing test of 5 minutes. Except these amazing features its next series, i.e. UltraKey 6 has released with some more attractive features. The plus point of this app is that it has a success based instruction which helps kids to gain the accuracy in typing and also find out the typing errors which helps to point out the trouble areas correctly. The minus point is, it doesn’t have any typing game which fails to keep children’s to engage in typing. UltraKey personal subscription- US $19.95. UltraKey family subscription- US $49.95. UltraKey School subscription- US $43.96. UltraKey Multi-school subscription- US $ 0.99 – US $43.96. UltraKey is compatible with platforms like Windows 10, 8, 7, OS X 10.4, XP and Vista. UltraKey is one of the most powerful software as it provides its users with reporting tools for educators. 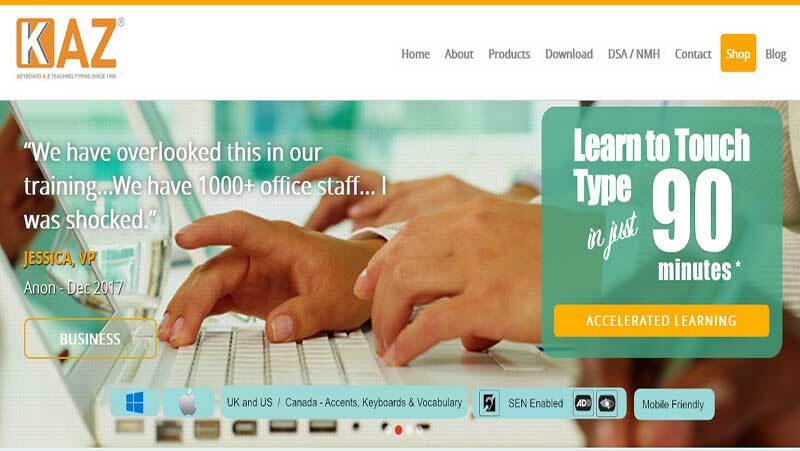 This is the best typing tutor software, and it is developed by educated professionals. UltraKey helps users to set their goal which is very important in the way of learning and success. As we all know that “change is the spice of Life” and Rapid Typing comes right to these words. Like any other app, this app also helps you to improve your typing skills, but with this, it also helps you in deciding how you can use your keyboard more efficiently. Rapid Typing helps learners by teaching them about fun in improving typing. The Rapid Typing offers full courses to all skill level learners like beginners, advanced and experts. This software works on virtual keyboards like QWERTY, Bepo, colemak, Dvorak, and ABNT. This software also keeps a record of your progress like words per minute, delay, accuracy, etc. Lesson editor helps to save the changes and add new lessons to give an experience of customization. This software also comes to users with Portable Version. Customisation of the lessons, different colourful themes and interactive surface, moving hands with a virtual keyboard are some of the plus points of this software. Minus points includes irregular typing, confusing interface and lack of instructions for the users who are using this software for the first time or for those users who are yet to be familiar with this software. In today’s economy paid softwares are not affordable; then why to waste money on them whereas this software is available for free, free, and free. Rapid Typing software supports on platforms like Windows 10, 8, 7, Linux & Unixes, XP, Vista, OS X, and Chrome OS. On the Rate charts, Rapid Typing scores 4 Stars out of 5. WHY TO USE RAPID TYPING SOFTWARE? Human memory always tries to keep the things which are presented attractively, and Rapid typing offers colourful themes which encourage the user to improve the typing skills in a more effective and fun-loving way. Here, I will not reffer this software to the beginners because of its lack of instructions while typing. 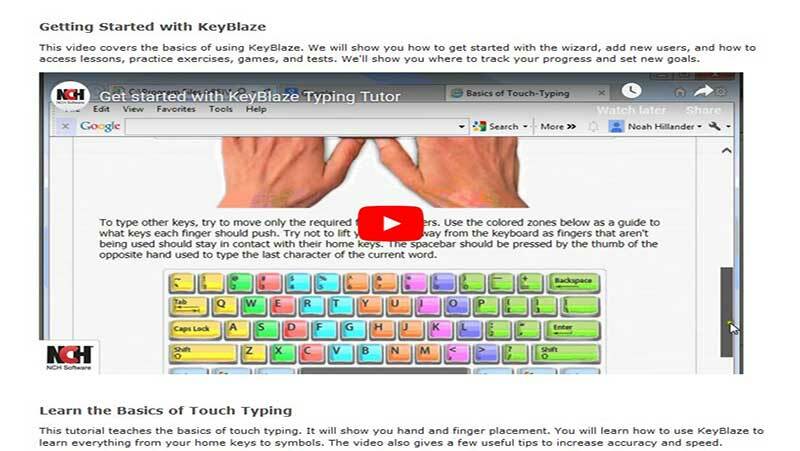 KeyBlaze is the typing software designed for all skill level users. This software designed to teach you how to type efficiently and how to learn it in a very joyful way. This software gives you the basic knowledge about the neighbouring keys and home keys. To practice, it includes prose, poetry, advanced keys and allows you to participate in online typing quests. It starts with the primary keys then slowly speeds up with punctuations, numbers, capitalisation, neighbour keys etc. It operates with an initial skill test of the user to guess the current level. Drills, poems and more for practice purpose. It also records WPM (Words Per Minute). KeyBlaze keyboard highlighting shows where to place the finger for accurate typing. For transcription practice KeyBlaze gives dictation audios. KeyBlaze includes typing games to make typing skills more attractive. It provides with a course completion certificate. It helps to set speed goals for typing of the personal words. KeyBlaze identifies the troublesome words and characters which need more practice. It deals with all the aspects required to correct the typing skills. No payment is needed to download this software. The purchase is required for accessing more in-depth games. The free version of KeyBlaze supports only windows 8 & lower. This software is with very outdated looks. The users who are looking for the best typing programs for free, KeyBlaze software is the best option for them. For the premium version you have to pay the US $29.99. KeyBlaze software will give you a better experience on platforms like Windows 10, 8.1, 8, 7, XP, Vista, and Mac OS X 10.4 or later. This typing software earns only 3.9 stars out of 5 on rate cards. One of the important reasons to use this typing software is that it helps to engage your all 10 fingers with 10 keys. This software is designed for young ones to older ones. It presents your progress card with pictures and scores. So click here to download KeyBlaze. For learning anything, we need entertainment and motivation, and Typing Instructor Platinum helps you in this. This software comes with entertaining; educational and motivational contain which attracts kids, teenagers, and adults. This software helps you to improve your keyboard skills and makes you a fantastic typist. Typing Instructor Platinum also helps an advanced typist in creative learning schemes and fast-moving arcade style games which don’t let anyone get bored. It has professionally designed learning skills for every skill level learner whether it may be a beginner, intermediate or advanced typist. This software contains more than 20 typing plans, and you can design your personal typing plan with a lesson. It gives progress reports of each finger, key, row and hand separately which helps you to find your strength and weaknesses. Typing Instructor Platinum provides 100+ lessons which help you to speed up your typing skills with accuracy. This software creates particular lessons for you by finding out your weak points with its dynamic learning feature. You can choose trending topics like sports, medicine, literature and more for article typing at the time of practice, so it makes your typing skills sharp. This is the only software available which allows you to create your own personalise lessons, test and articles and even you can add music as well. Typing Instructor Platinum contains more games than any other typing software available in the market that is the reason it is one of the most entertaining typing software than others. One of the minus point of this software is that it doesn’t include real-world exercises. The trial version of this software is free, but if you want to purchase prime version of Typing Instructor Platinum, then you have to pay the US $29.99, no offers or discounts on the purchase are available (till the time am writing this post). Typing Instructor Platinum compatible with platforms like Windows 10, 8, 7 and XP. 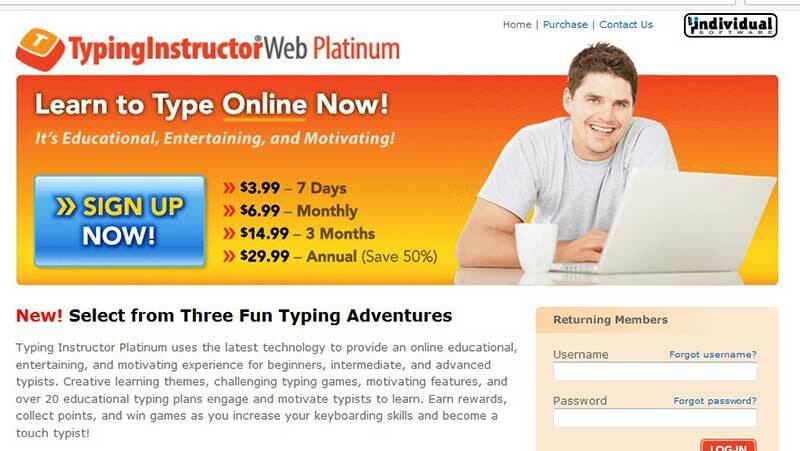 On the rate chart, Typing Instructor Platinum earns 3.9 Stars out of 5. WHY TO USE TYPING INSTRUCTOR PLATINUM? Typing Instructor Platinum is more entertaining typing software as it contains unique travel themes. It helps all skill level typists from beginner to advance. This software helps to explore your typing skills more efficiently and with accurate results. 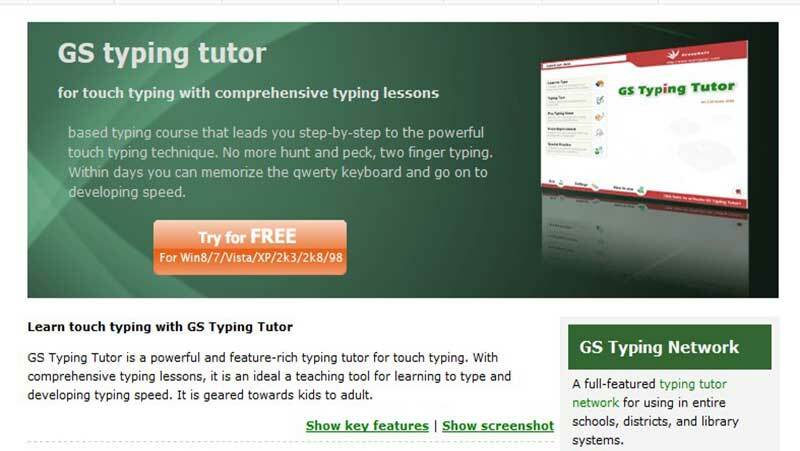 If you want to be an expert in touch typing, then GS Typing Tutor is an excellent choice for you. It guides you step by step; hence; you will quickly learn to type on QWERTY Keypad and becomes a master in super fast typing. 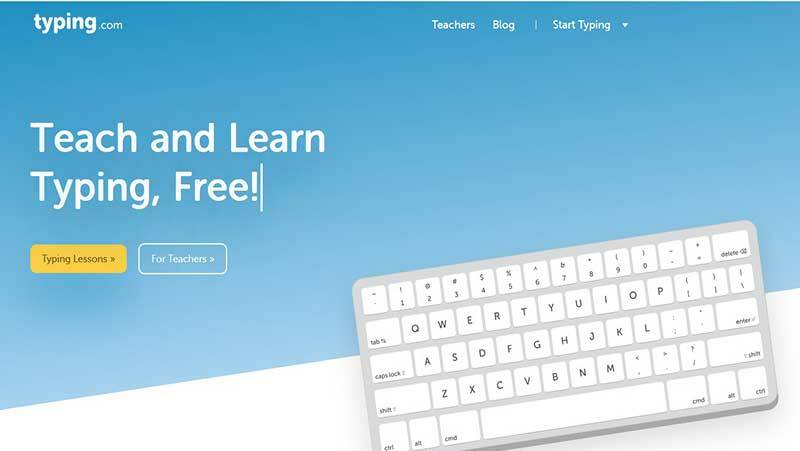 GS Typing Tutor is designed for kids to adults. This software is a full package of every kind of typing lessons. You can improve your typing skills from the primary level to advance level and unique characters with numeric keyboard. Onscreen keyboard feature helps you to locate keys while typing and also helps to learn the keyboard. 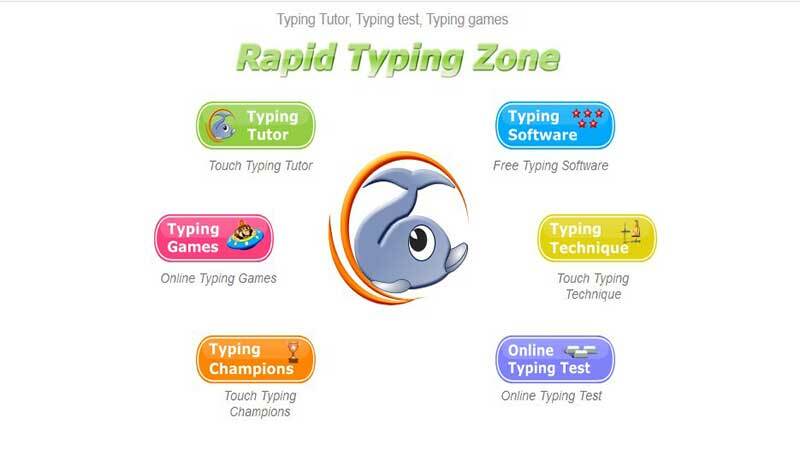 This software helps you to improve your typing speed with the number of fun-loving games and lessons of typing. GS Typing Tutor helps to track your growth and identify your weaknesses in typing and allows you to practice with these keys in customise review lessons. A coin always has two sides so as GS Typing Software also have positive and negative sides. Plus point of GS Typing Tutor focuses on your typing speed and accuracy in typing. This software helps you to develop one-handed typing skills, and you can use this skill on keyboards like QWERTY, Dvorak Left and Dvorak right. This software is last updated in the year 2008 no latest updating to its version. Other softwares come with cloud techniques, and this software works on outdated techniques. They didn’t update with technical team contacts. You can take a trial of this software free, but if you want the full version of this software then you have to pay US $29.95. GS Typing software ratings are 3 Stars out of 5. If we compare GS Typing Tutor with other typing softwares, it provides users with non-technical interface and allows you to change colours, fonts etc. as per your requirements. One of the main reasons to use this software is that it provides you with user-friendly assistance. 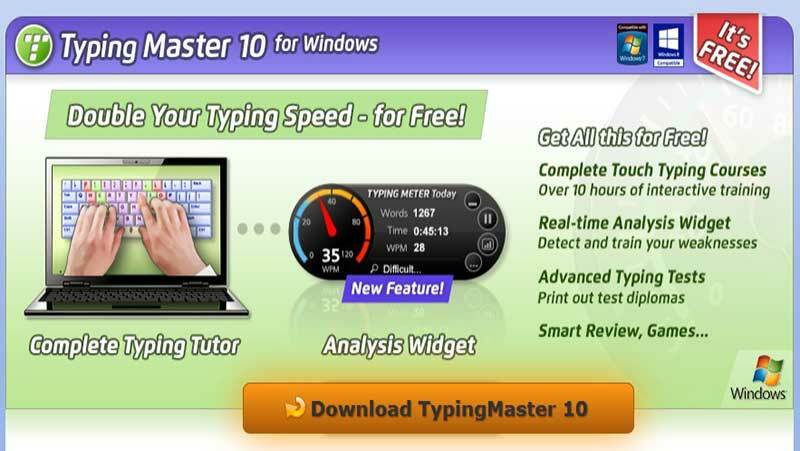 Learning of keyboard in a very fun-loving way, speed up your typing skills, examine your accuracy and speed all these things you can expect from the Typing Master 10 software. This software provides you with typing games which effectively works for speeding up your typing skills. You can analyse your typing speed on analysis widget and work on your weak points. This software teaches you to use a keypad in the most fun-filled way by providing fun games which help to speed up your typing. This software gives command of various training material for free which increase your typing speed. Bite-size exercises are available which are easy to fit in the daily training schedule. At the time of using another computer, its satellite feature tracks your typing which helps you in improving the skill of typing. The interface of this software is not attractive. For Standard English Version you have to pay $ 14.90, and for the multilingual version you have to purchase it for the US $ 24.90 for a lifetime license. It gives you a better experience on platforms like Windows 10, 8, 7, Vista (34/64 bit). It earned 4.2 stars out of 5. Typing master 10 provides you professional course with a variety of typing test which helps you to improve your typing speed and accuracy. This software helps you to be a master of typing skills by providing fun loving typing games, different typing activities, lessons, reviews and keeps the record of your progress. 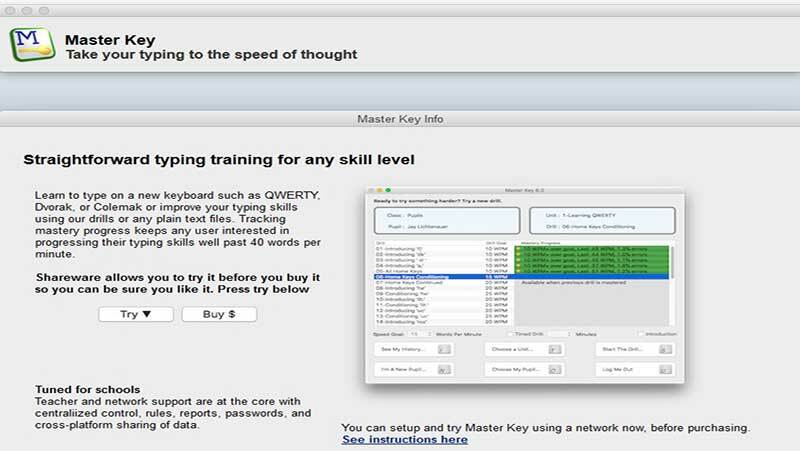 By using Master key software, you can improve skills of typing on keyboards like QWERKY, Dvorak and Colemak. This software records your growth and helps to speed your typing 40 words per minute. This software helps to keep only dynamic information. You can create your drill with the help of its drill editor. The option of pause the drill is available so you can do other essential works if any. It allows corrections in precious line. Teachers can synch the whole class, their reports and class editor allows change setting for groups and able to exporting and printing of class reports. The technical team supports promptly via emails. More than 400 exercises and activities to improve typing speed. Beginners and experts both can use this software. User-friendly interface and lightweight software size. This software allows creating own exercise and drills. This software enables control over learning scenario. Graphics and interface are outdated. This software is not compatible with Windows 10 platform. This software provides with limited support options. Numeric keypad exercises are very less. You can purchase this software in the US $12.00. Master key software compatible with Windows 10, 8, 7, Vista, XP and Mac OS X 10.4. Master Key obtains 3 stars out of 5. This software provides you with unlimited trials before purchasing. You can track your goals and achievement, and this allows with drill control. This software offers a game like paratyper which makes your learning process fun-filled. Typing software helps you to speed up your typing with more accuracy. Fast typing may save your time, and you can achieve your goals in no time. Typing is something which needs more time, and you got fatigue if you are not a fast typist. Having typing speed may add another feature to your carrier, and some job required typing speed. You can also use the above listed free software’s to improve your typing skills with accuracy. You can search good typing class which helps you to speed up your typing. You look towards the screen rather than keyboard; your inner instinct will automatically instruct your fingers. For improving typing speed naturally, you can participate in online typing quests. 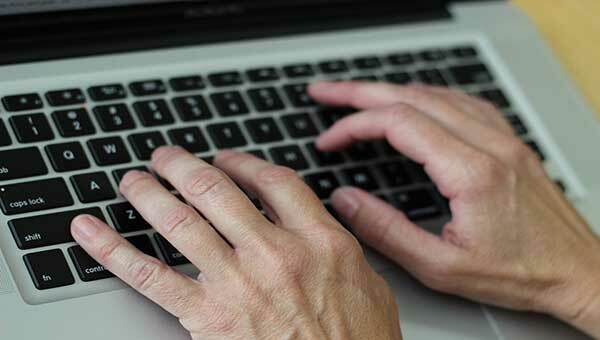 You can also use online touch typing software which helps you to speed up your typing with accuracy. After analysing all the free and paid software I realise that everything you do needs dedication and love for your duty then nothing is impossible. You can use these software which speed up your typing skills more effectively and accurately. These software definitely helps you to be more confident about your typing speed and efficiency. So friends take help of these softwares for improvements in your typing speed and be a master typist and don’t forget to share your reviews with us.